Companies know that there might come a time when they’ll eventually have to let go of one or more employees. There are various reasons as to why an employee would have to leave a particular company. These reasons would include finding better job opportunities, family issues, or even going back to school. So when these employees request to leave the company, management should provide these people with a document stating that their resignation has been approved. 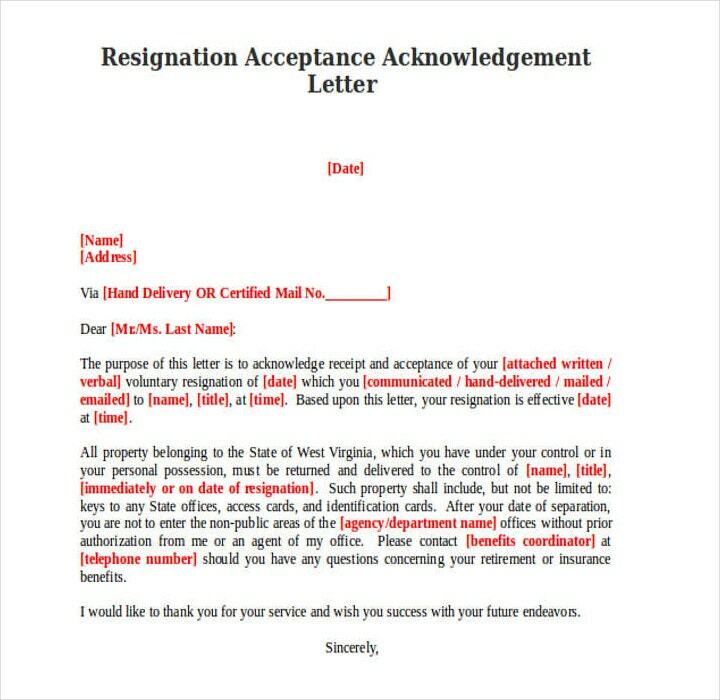 These are what you call resignation acknowledgment letters and this article is going to focus on how you can show your employer that you’ve accepted his or her desire to leave your company. 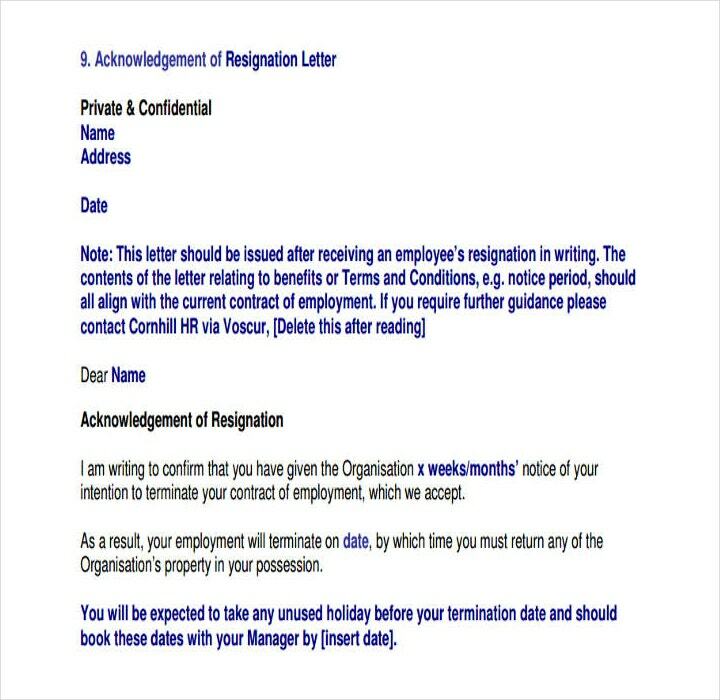 Develop a logical system for handling resignation letters. You have to do this otherwise you’re going to look very unprofessional. When an employee resigns, he or she will probably talk to you regarding the steps required to make the transition out of your company go as smoothly as possible. So what you’re going to have to do is provide the employee with professional advice, as well as maintain and outline the structure for items such as severance packages, leave notice requirements, provision of a forwarding address for the employee’s final pay, and the final date of employment. Determine when counter offers should be made. There are various factors that go into determining whether or not you should make a counteroffer to an employee intent on resigning. It’s your job as an employer to know when a counteroffer is acceptable and when you should just let the employee go. There are those employers who retain a policy of never retaining an employee who no longer wants to be a part of the company. However, it’s always best to have a policy of negotiating with employees to make them want to stay, especially if these people are of really high value. Let’s say that the person who’s leaving your company is a high ranking official such as a sales manager, you would have to look into why this employee wants to leave. If the reasons are things that you can fix, then you have the option to correct them so that the employee stays. Draft the acknowledgment letter. 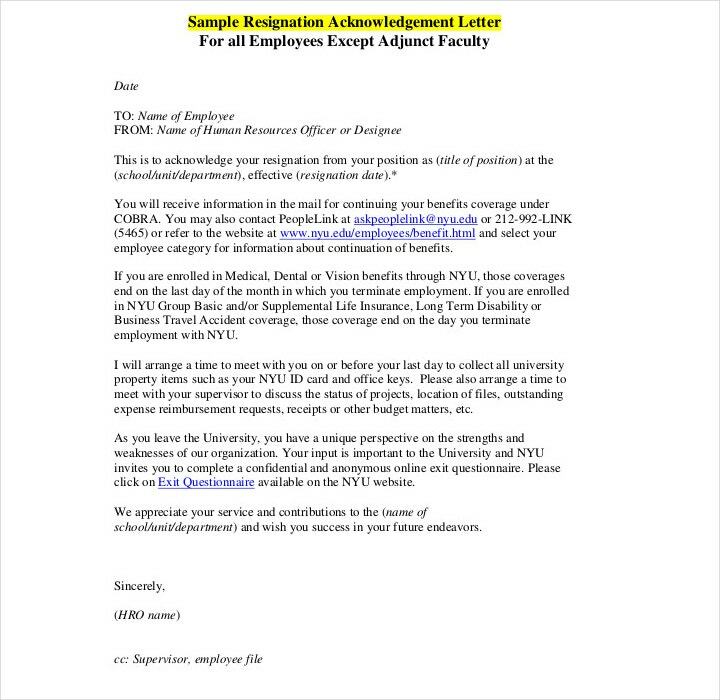 This is the part where you may now create the letter showing that you have accepted the employee’s decision to leave. If you have decided that it’s best that you let the employee go, or if the employee doesn’t accept your counteroffer, then you may write the letter which shows that you regret the loss, but understand and accept it. Inform the date of when you received the letter, as well as the employee’s final workday. Remember to remain cordial and wish the employee the best. Protect important and confidential business information. If your company gave the employee access to things such as credit cards, bank accounts, laptops, electronic equipment, or any other piece of company property, then you have to guarantee that these are all returned. After the employee has left, you have to eliminate the former employee’s access to security cards. You can even change the login info to ensure that the employee is no longer able to access company information. This should be at the top of your priority list when accepting the employee’s resignation. 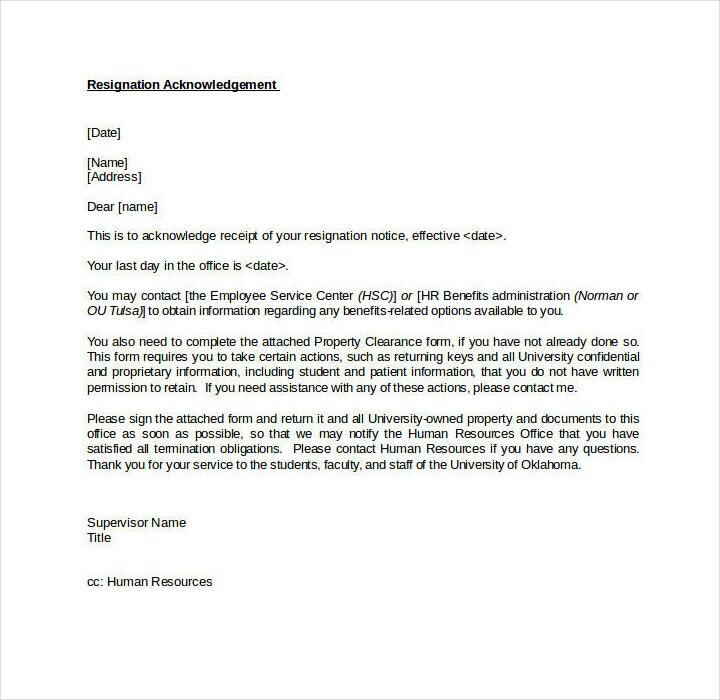 In the event that the employee was required to sign a non-compete agreement during the hiring process, then you have to go over this document with the employee upon receiving the sample resignation letter. 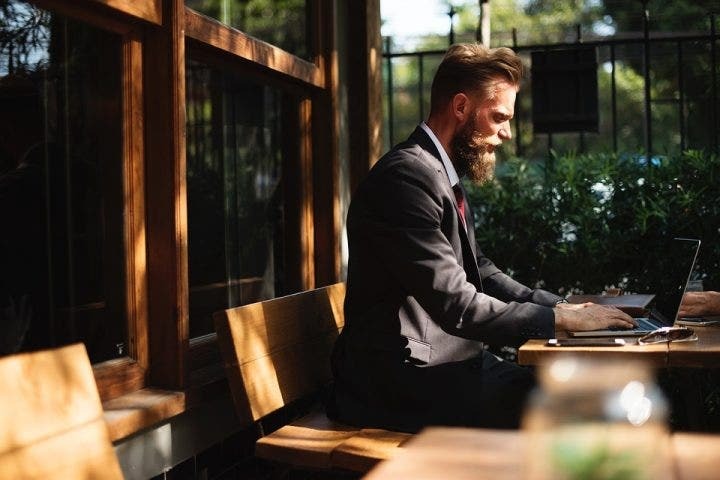 This will ensure that the employee is fully aware of his or her limitations with regard to releasing company information or contacting clients or associates of the company. Make sure that the employee wraps things up. If the employee who’s resigning is in the middle of a company project report or deal, then get the employee to finish it. If the employee cannot complete the project or deal before he or she has to leave, then make the employee draft a report outlining what has been done and what is left that needs to be done. You must also instruct the employee to provide a list that contains the important emails and computer files for his or her replacement. So make sure that employee knows what you’re expecting before he or she leaves the company for good. Establish an end date. Usually, human resource guidelines require that the employee give at least a two-week notice before resigning. At the end of these two weeks, the employee may leave the company. Based on what you know about the employee’s workload, you may or may not extend the employee’s deadline. An employee’s end date can also vary depending on the employee’s position within the company. The reason for this is because the higher the position, then the more responsibilities the employee will have. And the more responsibilities, then the more time it will take to finish projects that are still being worked on before the employee may leave. 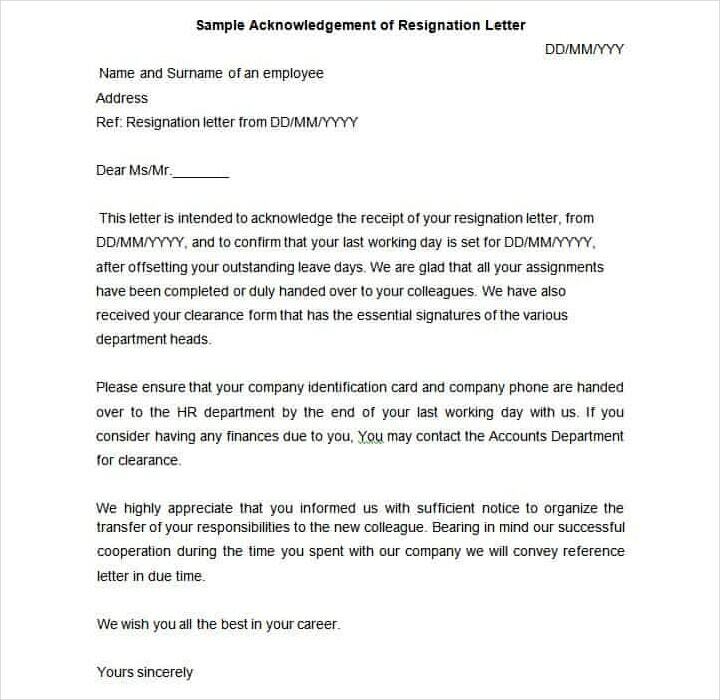 So make sure that your employer gives you a resignation notice before he or she leaves. Work on hiring a replacement for your employee. When you have accepted that the employee is going to leave the company, you have to start the process of replacing that employee immediately. 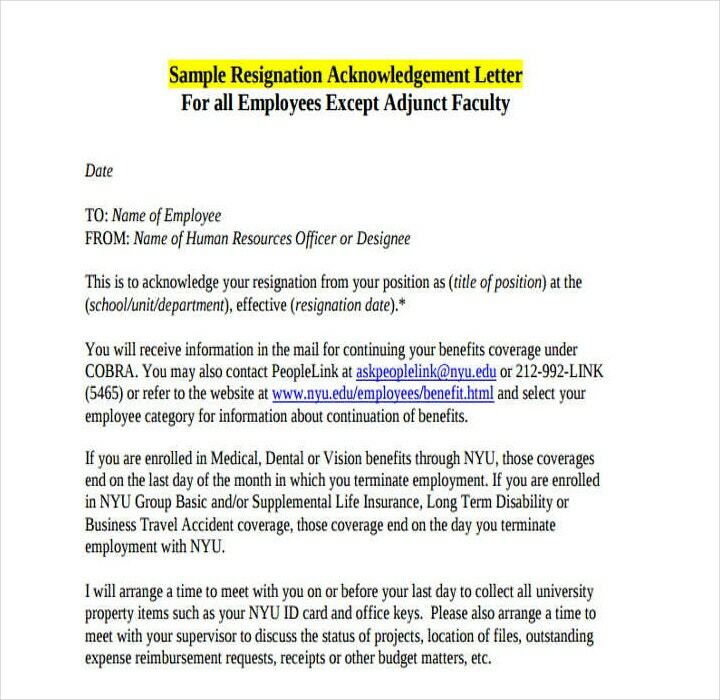 You can go to your current staff to see if you have anyone who’s capable of handling the responsibilities that were left by the resigning employee. Ask the outgoing employee as to who he or she thinks would be a worthy candidate. If there’s nobody within your company that’s qualified to take over the position, then you can start the hiring process where you will be reviewing external candidates. Plus, there might be more information that you’ll be able to uncover other than what you get from the employee’s resignation letter. Conduct an exit interview. Before the employee leaves, make sure that you’re able to get as much info as you can regarding his or her experience working for your company, and what the employee felt. Encourage the departing employee to be completely honest in the evaluation. Make sure that you listen carefully so that you can better identify the kind of replacement that you’ll need, as well as adjust your expectations for the person that’s willing to take over the position. 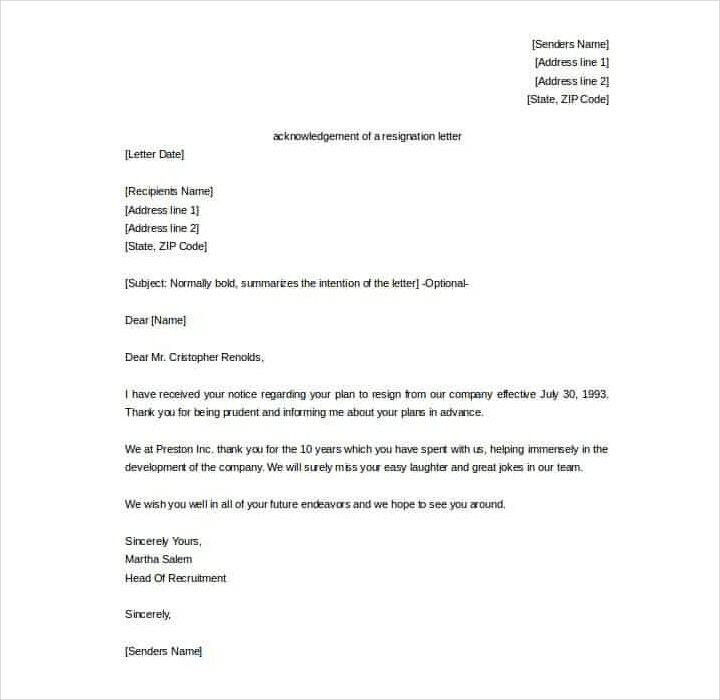 Use business letter format. You have to consider that this a professional letter, so it’s best that you use a business letter format for it. So on the top left corner, include your contact information and the contact information of the employee that’s resigning. Then you have to make sure that you sign the letter and type your name right below it. Accept the resignation. When you’re writing the body of the letter, you have to state that you have accepted the employee’s resignation letter in PDF. The statement should also show the employee’s official last day of work. You’ll want to make sure that this is on here as it needs to be on file in the employee’s records. Express your understanding. While it’s never a great thing to lose an employee, it’s best that you show that you’ve accepted his or her decision. So your response should indicate that you regret the loss, but that you respect and understand the decision that the employee had to make. You can even go so far as to provide your employee some assistance such as making sure that he or she has a good reference. Just remember that it’s completely optional if you want to help him or her out, so long as you show that you understand the choice that the employee made. Keep a record. 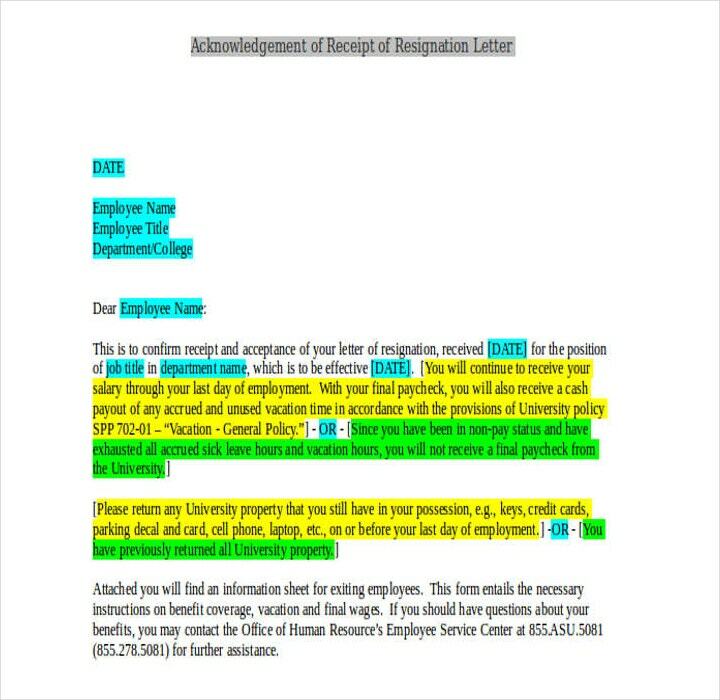 Make sure that before you send the letter to the employee, you have a copy that you can place in the employee’s file. You can either keep the letter yourself, or you can send it to the Human Resources office so that they can put it on record. This information might come in handy for when an employee wishes to return and if you would like to know information regarding when the employee left and why.